Savage Arms Company shoots every 10ML-II several times before it leaves the factory, as they have been doing for over a decade. Each 10ML-II gets a proof load, followed by standard loads for function testing. The standard Savage Arms load is specifically: Winchester W209 primer, short black MMP sabot, Hornady .452 in. 250 grain XTP #45200, 42-43 grains Hodgdon / IMR SR4759. This is the "factory Savage Arms" preferred load recommendation. The loads that Savage Arms suggests are in the factory 10ML-II owner's manual. Several years ago, I published an interview with Gary "DOC" White, of White muzzleloader renown. The original interview is on this site; an updated edition is on Doc's own site: http://www.whitemuzzleloading.com/myweb2/images/whiterifles/an_interview_with_doc_white.htm . Part of the interview discussed smokeless muzzleloading hunting and long range muzzleloading hunting. These are a few of Doc's comments. The onslaught of smokeless muzzleloading is inevitable and only awaits the development of sabots that will stand up to the pressures and heat, a powder that is relatively bulky and safe to use in volume loaded format and the widespread acceptance of smokeless muzzleloading by state game departments. The issue is not target shooting, but hunting, which is where the numbers are, which is something I've been trying to tell the NMLRA for years. Once state game departments come to not care about the propellant, smokeless muzzleloading will blossom. Surely it must be evident that my T-Bolt was designed with smokeless in mind, at least eventually. Just to give the concept a good try, I took a 45 caliber T-Bolt to Africa in 2004. I killed 9 head of game, all the larger plains type, with 11 shots, the guide insisting on repeat shots in a Kudu already dead on his feet. Once he discovered how effective the rifle was , there was no more fuss. All the other 8 animals were taken with a single shot. The load was a saboted 45/40-350 Power star bullet over 35 grains of 5744, at 1550 fps. The longest shot was 180 yards on a black wildebeest. It knocked him flat. Muzzleloading will follow in the same fashion as currently cartridge shooting follows. The writers write about it (or should I say lie about it), the customers buy into it, the companies are happy to produce it, and everyone continues to shoot their deer at the normal 60-120 yards that we have been shooting deer since the days of Simon Kenton. Long range shooting is far more difficult than anyone imagines. Game does not hold still like targets do. Game likes cover. Game wiggles and runs and flees. I could go on and on. Suffice it to say that the debate is fun and developing the technology even funner, but the limitations of human vision (even with scopes), the deterioration of hunting skills and prowess, (simply because of lack of opportunity- consider that the greenest greenhorn on Ashley's first trip to the Rockies killed more game that year than you will in a lifetime) and game behavior will continue to dictate that most game will be collected at current average ranges. Only a few will maintain skill enough to take advantage of the new technology. At one time, 35 - 36 grains of Accurate 5744 was considered a full-powered hunting load. It was close to what earlier sabots could take using 300 grain sabots. It still is a good, easily ignitable, soft-recoiling load today. 40 - 44 grains is suitable for properly fitting, modern sabots yielding approximately 2080 - 2125 fps with 300 grain saboted bullets, contingent on individual rifle. Just so you know, we do have the N120 available and people can contact me direct to order. 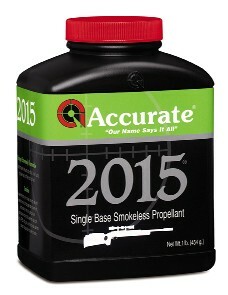 Accurate 2015, a short-cut extruded propellant, is also a long-time favorite. 67-70 grains gets you in the 2150-2220 fps or so arena, again with 300 grain saboted bullets. Though today's current formulation sabots are about 25% stronger than those of ten years ago, they still have limitations. Absolutely precise limits are not possible, but sabot stress happens at 30,000 PSI or so and at 2400 fps or so. Under "perfect" conditions, with ideal interference fit between sabot and bore, ideal rifling depth, ideal rate of twist, a whole bunch of perfect ideals, 35,000 PSI and 2500 fps is possible according to MMP. However, "possible" is not at all a practical or intelligent way to look at hunting loads. 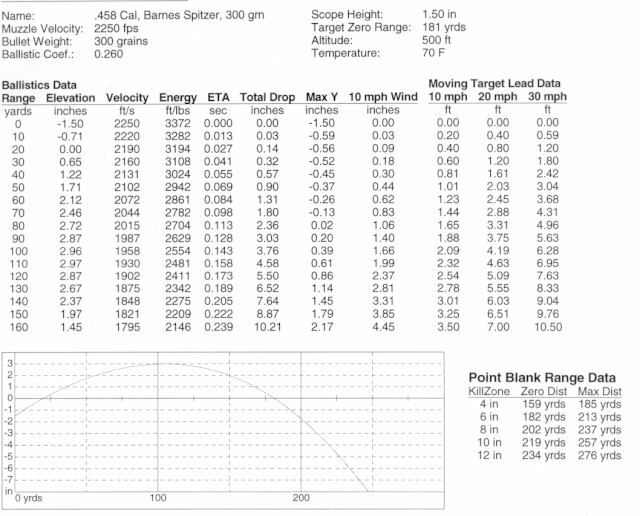 Reliability counts and shot placement counts, whether it is 90 degrees or zero degrees F.
As a practical matter, nothing beats consistency and reliability, so staying below 30,000 PSI MAP and 2350 fps has been a ten year basic standard for hunting load development with saboted projectiles as far as I'm concerned. Once the sabot is compromised, you have nothing. It never has made any sense to me to practice with anything but the identical load you intend to hunt with. If economical plinking is the primary goal, that's why we have .22 rimfires. I have my share of them as well. Deer don't care how fast you miss them and muzzle velocities only count if you are shooting at things that land on your muzzle. There is no substitute for proper shot placement yet and it doesn't seem like there is going to be anytime soon. Accurate 5744 remains a superb field powder. It is efficient, meaning low charge weights, low recoil, and low cost per shot. It is also easily used with the yellow Lee Smokeless Powder Dippers, either the 3.1 cc or the 3.4 cc dipper. Accurate 5744 is 20% Nitro, considered a "position insensitive powder," and is the easiest to ignite propellant for the 10ML-II. The fellow that learns his trajectory is miles ahead of those that don't practice, just like everything else and muzzle velocity never has been any substitute for learning your rifle. Out to 225 yards, Accurate 5744 has always done the job. Nevertheless, sometimes more is more. N120 is excellent if you can find it (call Jeannie Bolda at Kaltron), but Accurate 2015 and Reloder 7 both have the ability to produce similar external ballistics. 2300 fps with a 300 grain saboted bullet is all the recoil I care to enjoy at the bench. Maybe you might prefer more shooting discomfort, but I can tell you that I do not. I've hunted with 290 - 300 grain saboted bullets and either 5744 or N120 for the last seven years in the Savage 10ML-II. Accurate 2015 or Reloder 7 gets you similar exterior ballistics. My favorite all-around .451 bullet is the Barnes 290 grain Spitfire T-EZ Flat Base with an MMP HPH-12 sabot, available in 75 pc. bulk packs as shown above, Product SKU: MZ-45192B. SD is .204, BC is .223. The strongest sabot is the MMP Orange .458 / 50 sabot. It is often the most accurate sabot, as its thinner petals promote a fast, clean release from the bullet. They are readily available from http://mmpsabots.com . An accurate and affordable bullet is the Hornady #4500 300 grain hollow point, shown above. It is a .45-70 (.458) bullet that has taken most everything that can be taken. Its static B.C. is .197 with a sectional density of .204. They go for about $20 for a box of 50 bullets: quite a bargain in 2011. Use the Orange MMP .458 / 50 sabots with this bullet. 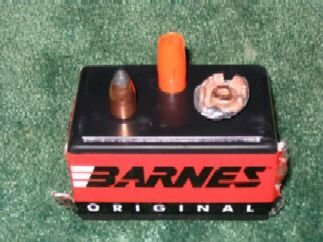 The Barnes Original #457010 Semi-Spitzer Flat Base .458 is the best flying 300 grain .45 bullet I've found up up until quite recently. Its published BC is .291. It also has a very tough, .032 in. thick jacket-- ideal for anything, but especially good for heavier, tougher animals. I've used it on everything from pronghorn at 287 yards to Russian boar and large bears. 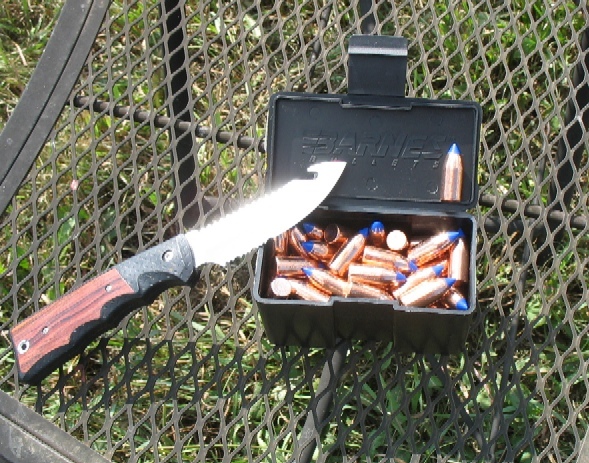 With either of these .458 bullets, you use the same MMP Orange .458 / 50 sabot. All around use, use 5744. For a bit more velocity, you might wish to consider Accurate 2015 or Reloder 7 as mentioned above. Approximate exterior ballistics follow at 2250 fps. A note on Ballistic Coefficients: static or "one number" ballistic coefficients are ALWAYS wrong, no matter who prints them. Ballistic coefficients change continually based on velocity, and further . . . ambient conditions can change ballistic coefficients by 30% or more. See http://www.exteriorballistics.com/ebexplained/articles/the_ballistic_coefficient.pdf for more information on this topic. For this reason, along with your exact scope height and many other reasons, you must do your own range work to confirm the trajectory of any load out of your rifle. No one can do this for you. As for how far you can shoot, that's entirely up to you. If you can confidently place a bullet into a 4 inch circle at a particular range under actual hunting conditions, then of course you can confidently hunt at that range, whether it is 100 yards, 300 yards, or 500 yards. It's all up to you. For the 10ML-II, Henry Ball feels that 25 in/lbs is ideal, regardless of stock. Everything we do is contingent on the performance of the polyethylene sabot. Unfortunately, it isn't easy to tell how old a sabot is just by looking at it or even who made it. Contingent on how retailers handle their inventory, we could be using old formula sabots that will not give us good performance. 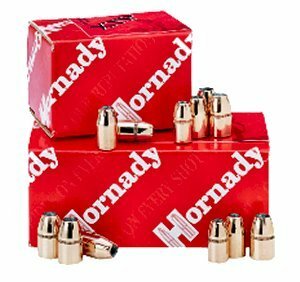 For Hornady .452 250 grain and 300 grain XTP bullets, please take the vital variable out of the equation by getting fresh sabots from MMP at 870-741-5019, or see their website at http://mmpsabots.com. You need the short, black "MMP" 50 x. 451 sabot. For longer bullets, MMP offers the .50 x .451 HPH12 and HPH24 sabots. The HPH24 sabots have an assembled outside diameter a bit smaller than the HPH12 sabots and are easier to seat. Ultraviolet light attacks and destroys sabots-- please do not store them on your dashboard, etc. A cool, dry place is best-- storing them where temperatures breach 150 degrees Fahrenheit can also render then useless. My personal favorite is the Orange MMP .458 x 50 sabots, used with Barnes Original 300 grain semi-spitzer soft points or Hormady #4500 300 grain hollow points. Old sabots are generally worthless, as are sabots branded by other manufacturers. Forget the marketing hype: there is no such thing as a "high pressure sabot" or a "low drag sabot." All sabots are high pressure, or they wouldn't work. There never has been a low-pressure sabot or a "high-drag" sabot. The Savage Owners manual lists loads for 250 grain to 300 grain projectiles. For best results, stay within that range. The Hornady XTP bullets mentioned above have been proven over tens of thousands of shots over sixteen years, and rate a "MUST TRY." 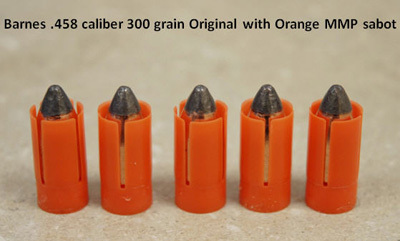 Other sabot / bullet combinations have since been found suitable such as the 290 gr. Barnes TEZ flat base with the supplied sabot (or sub in a MMP HPH 12 sabot for a snugger fit), and the Orange MMP 50 x .458 sabot married to the .458 Barnes Original 300 grain Spitzer Soft Point #457010 and the Hornady .458 300 grain Hollow Point #4500. These combinations work exceeding well in most Savage 10ML-II rifles-- please take advantage of the past, well-proven results. Use of "Powerbelts" and other bore-sized conicals with smokeless powder is clearly prohibited by the Savage 10ML-II Owner's manual. They are undersized, and can cause misfires. The green gas check at the base has a hole in it, and is insufficient for smokeless powder. By virtue of being bore-sized, they fly poorly compared to the Savage recommended .45 caliber projectiles. Not jacketed, they are copper plated ("copper clad") or just pure lead. They have been tested, and in addition to all the other problems, filling your barrel full of lead has been the result-- a horrible mess to try to clean up. However, heavier Powerbelts and other heavy conicals do shoot quite well out of the Savage when used with Pyrodex or Triple Se7en-- but please do not cause yourself problems by using them with smokeless powder. Their use is prohibited with smokeless powder by Savage Arms: smokeless is for 250 - 300 grain "saboted projectiles only." All of these starting loads produce generous velocity, energy, and terminal performance to quickly, humanely harvest deer-sized game to 300 yards. Additionally, you will appreciate the low recoil, low cost per shot, and low stress on your sabot, scope and mounts. You may not want or need to increase the respective charges beyond these levels. However, you can certainly work up a load by increasing your powder charge weights in one grain increments to the levels stated in the Savage Owner's manual. When your groups start to open up, it is time to back down that powder charge a grain or so-- you have reached the reliability and accuracy limit of your sabot. It makes no sense to try the same powder charge again and again hoping for a different result. We need to work up a load, using starting loads-- not start high and work down. This gives us the accuracy and performance that we all seek, and is immensely satisfying. X. USE BLACKHORN 209 IF YOU WANT A "BLACKPOWDER SUB"
It is, by far, the best available black substitute class propellant, nothing else is remotely close. Load data is here: http://www.blackhorn209.com/files/pdf/b209muzzleloaderdata.pdf . Use of a witness mark on a ramrod mechanically reveals and eliminates loading errors. Always use one to confirm your load. Savage allowed smokeless propellants are measured by WEIGHT. Blackhorn 209 is designed to be measured by VOLUME. Avoid boat tail bullets: they generally do not group well due to increased sabot stress. For an all-around load, use Accurate 5744 (40 gr. - 44 gr.) and a 300 grain .458 Barnes Original or the 300 grain Hornady #4500 HP ... both with the MMP Orange .458 / 50 sabot. Avoid gimmicky "muzzleloading primers." Use full-strength Federal 209A, CCI 209M, or Winchester 209 shotshell primers. I use Federal 209A primers exclusively. Please Note: Randy Wakeman, his agents, heirs and assigns, hereby disclaims all possible liability for damages including, actual, incidental and consequential, resulting from usage of the information or advice contained in this article. Use the data and advice at your own risk, and with extreme caution.